save_smart has no other items for sale. Arrived on time safe and just as described. read instructions ON the box. Delivered on time in good condition. USB not working, one key broken on keyboard, bad purchase. Did not work out of the box but seller quickly refunded. Neither the keyboard nor the mouse worked. I have not had time to return them. Keyboard and mouse did not work. reseller returned, but items didnt work at all, just FYI for anyone looking. Easy purchase & product came quickly, but the product did not work. Item came DOA, but I got a fast refund. Good quality keyboard, nice feel, nice full size, simple, sleek design. The mouse... not so much. Good quality keyboard, nice feel, nice full size, simple, sleek design. The mouse... not so much. First, rather than the exact mouse pictured in the keyboard/mouse combo, one of which I already own and like, the one I received is not the same. It even looks different than the one pictured. The wheel has a kind of a cheesy, clicky feel, instead of a nice smooth feel, and also makes a faint but noticeable and annoying grating, scratchy sound when used. Overall, the mouse is a bit too small for comfortable use by most adults. It works and does the job, and that's about the best thing I can say about it. Overall, the combo is a very good value and I think most people would be satisfied with its function and low price. I think the mouse is better suited to someone with smaller hands, like a young woman or kid. I think the set is reasonably durable and well suited for office, dorm or school use. If you have a bit more money to spend though, and want a more comfortable feel and smoother function, I'd recommend one of Logitech's higher-end model keyboard/mouse sets. I honestly expected this to be a lot better than what it is. Doesn't compare to my keyboard at work. Not even close. Despite this, it does the job. Simple plug and play. The mouse feels extremely cheap but can't complain as the mouse and keyboard work. There doesn't seem to be any lag and the range isn't bad. I tend to use this within 20 ft of my computer. This is more of a simple keyboard and is definitely not recommended for gaming. Since my budget won't allow me to have an illuminated wireless keyboard I sought for other regular wireless keyboards instead. I'm familiar with Logitech and I have been pretty much pleased with some of the electronic items I have from that brand. This keyboard comes with batteries for the keyboard itself and the mouse which surprised me. It was easy to hook up and it worked right away. Now I'm a heavy typist because of my nails and the keys suffice for me. It's more quieter than my other wireless keyboard. Since this keyboard will be used for my living room computer I'm pretty sure it will do what I need it to do. I like the fact that it has an on and off switch to preserve the battery life. Batteries for a wireless mouse doesn't last long so I don't know how the battery in the mouse will stand up. I now have two wireless keyboards and I must say the battery life for my first one lasts a pretty long time. I think I purchased this keyboard back in either 2012 or 2013 and only had to change the batteries once or twice. The wireless mouse that came with my first keyboard didn't even last a month!! So needless to say it's hard to give feedback on this mouse as far as the longevity of the battery but I must say the keyboard is great for it's multipurpose abilities. It is a great functional keyboard for the price you can't go wrong. The battery slot on the keyboard is a bit tight for rechargeable AAA batteries. Watch out for that power button on the top if you pick it up by the top! The mouse is sensitive works well on different surfaces but, it has no battery light. 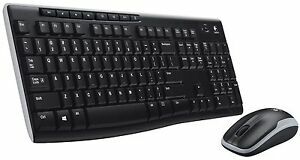 Logitech keyboard and mouse combo! I have used this combo before and needed a new one because my other mouse accidently went thru the wash :-O At first I thought my combo didn't come with the little usb thing and I was mad, HOWEVER, it clearly has pictured on the mouse that its inside the mouse LOL oh silly ME! Very happy and would highly recommend, its at a great price! works the minute you connect the usb to your computer! I love that the mouse and the keyboard can both be turned off! has volume control and can even put the computer to sleep from the keyboard! also I use the calculator tab on the keyboard A LOT! its just an awesome product!